Tailored, outcome-driven training programs to help you realize your climbing goals. 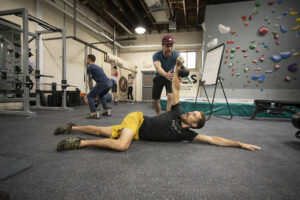 Whether you’re getting ready for a climbing trip, preparing for an upcoming competition, or just want to climb stronger, your custom program is designed with your schedule, personality, and experience level in mind to create a plan that fits your needs, and is both fun and effective. A tailored, outcome-driven training program to fit any fitness goals. Your custom program may be used to supplement group training, and may integrate on and off wall training. For individuals, or climbing partners. Members: $65, $585 for a package of 10 sessions. Non Members: $80, $720 for a package of 10. Members: $100 per session ($50 per athlete), $900 for a package of 10 sessions. Non Members: $130 per session ($65 per athlete), $ 1170 for a package of 10 sessions. *Monthly payment options are available. Buy a pass online and show up any time!